Amanda Wendling - Making It Up As I Go: Showering and more! I remember each of my wedding showers like they were yesterday. I remember the wine, the fun, the people, the wine (did I say that already? Ok, I miss wine!) and the celebrating. But, I also remember feeling overwhelmed – in an amazing way. I remember thinking how lucky we were to have so many people around who wanted to celebrate this milestone alongside us. And, even more overwhelmed by the incredible generosity of those individuals. Fast forward four years and immeasurable amounts of hormones later, and that overwhelmed feeling is immense after two amazing, beautiful baby showers! Baby Girl W and I have spent much of the past few weeks sharing our anticipation with our incredible friends and family. 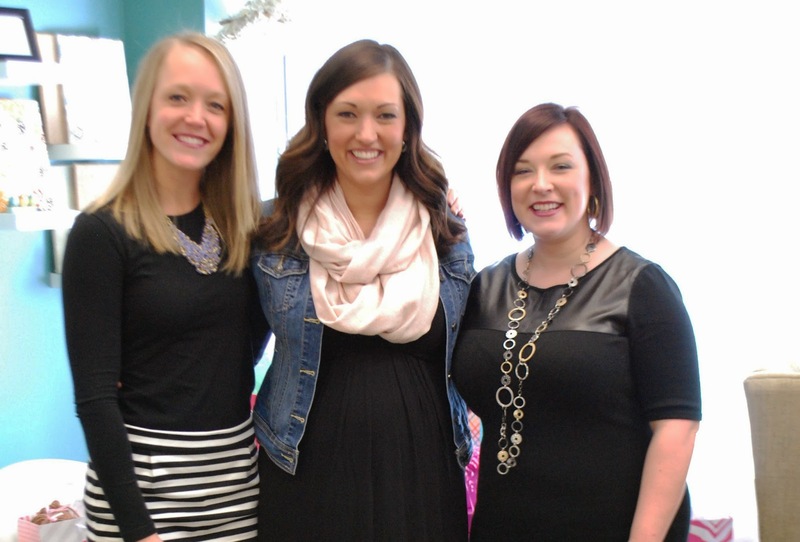 My first shower was held in Cedar Rapids and hosted by two of my very closest friends – Shay and Betsy. No detail was left unattended by these two. Seriously, it was beautiful! And, my second shower was held in St. Louis and hosted by my aunt – Teresa. Our lil lady is blessed to be joining a close-knit group of women that we call my extended family. I had to laugh as I noticed her barely moving on Friday evening while all of us ladies hung out laughing and chatting until way past my bedtime. I hit the bed that night exhausted, and what do you know, the little lady started kicking, punching and having her own little party. I swear she was saying “thanks, Mom, finally some peace and quiet!” She’ll adjust to the Buechter women in due time! It’s amazing the emotional effect that each of my showers had on me. Anyone who has seen me these past 8 months can probably attest to what a nervous wreck I’ve been. A high-risk pregnancy is no joke. But, something about my showers calmed me down. Knowing that she will be welcomed with so much love, and into a space that was prepared with her in mind has truly reassured me and helped me relax. A little glimpse in her room! Finally, although I hesitate to count our chickens before they hatch (in 6 weeks or less! ), I have to say how lucky we are. Not just because we have so many amazing family and friends who have been cheering our little peanut on and offering prayers for her not-too-soon and safe arrival, but because we have her. I let myself look into the statistics and read medical reports after we made it to a safer part of this pregnancy, and I can’t help but shed tears every time I think about them. After reading way too much information, (again, anyone who has interacted with me these last few months knows the gobs of information I have read) I understand the odds of me sitting here healthy at over 33 weeks pregnant were against us. But, I’m sitting here. Because this lil peanut is determined and driven to come out in due time, and meet all of the magnificent people who have been anxiously awaiting her arrival - including two pretty proud parents!